With Couponia, you have complete control over your homepage. Many themes offer one or two homepage layouts to choose from. They may have a couple of options for each, but you are basically stuck with whatever layout and order the theme author chooses for you. This is not the case with Couponia. Our theme offers a whopping seven different homepage blocks (including two unique featured product blocks) that you can display in any order you'd like! Use this block to announce a sale, post a testimonial, or whatever you want. Simply choose which collection to display and they'll show in a beautiful carousel. 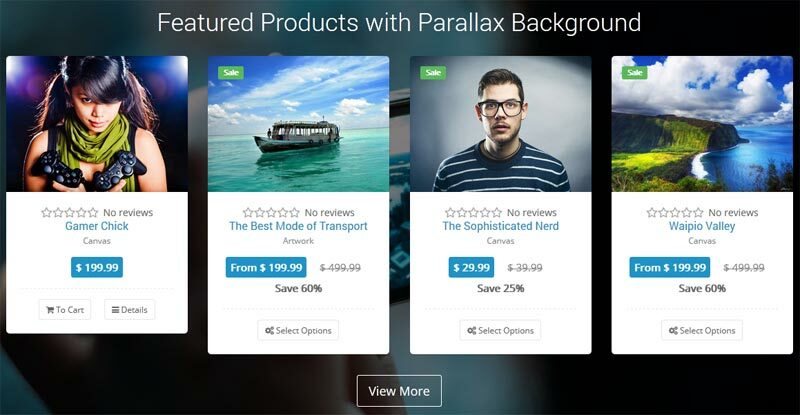 Choose a collection and specify a background image and your products will display in front of a stunning parallax (or static) backdrop. Unique images with text overlays that you can use to promote collections, sales, or whatever else you'd like. This block is a great way to promote things like free shipping, your return policy, or anything else that makes your store great. Studies have shown that an effective blog can bring a lot of traffic to an e-commerce site. Display your recent posts proudly (and beautifully) with this block. Last but not least, you can display the content of any page in your store. The possibilities are are virtually endless!